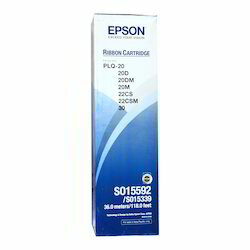 We are a leading Wholesale Trader of olivetti pr 2 ribbon and epson ribbon cartridge from Mumbai, India. This Olivetti PR 2 Ribbon is used for home printers as well as office printers. PR2 plus is the specialized printer for multifunctional front-office applications capable to print on single-sheet and multiple-copy documents and on passbooks. All models feature an innovative CPU and the new 2295 Hz printhead for outstanding productivity on texts and graphics alike. The printer produces 291 pages per hour on the ECMA Test, more than any other model in its product class. PR2 PLUS handles a full range of bank teller forms, recognizes passbook magnetic stripes, reads CMC7 and E13B codes and provides (as MB-2 model) simultaneous dual-side scanning for documents with widths of up to 210 mm. Equipped with a full character-generator set, PR2 plus is an efficient device to meet local compliance requirements around the world. Attention to printing quality is combined with superior productivity: PR2 plus uses a new-generation ink ribbon able to print up to 10 million characters. The 24-pin printhead (0.25 mm diameter) is designed to service the entire machine life (at least 5 years) and manage a daily workload of more than 300 transactions at competitive speeds. This Ribbon Cartridge gives superior prints and is sure to last long.